Sandip H. Patel was a panelist at the PTAB Bar Inaugural Conference, held on Wednesday, March 1–Friday, March 3, 2017. 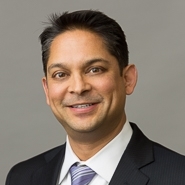 Mr. Patel's panel “Patent Owners and Petitioners Weigh In” discussed whether the PTAB should view its role as truth-finding or assessing whether burdens have been met. In addition, panelists discussed the PTAB’s guidance on follow-on petitions and possible liberalization of the interpretation of the institution standard, and comment on possible solutions for claim amendments.